Home grown Basil tastes better! Spring has really sprung with deciduous trees coming into leaf this week. I love the fresh new growth. The colour green is so relaxing. Cat lovers will be happy that our new season Cat Grass has arrived. This grass is so full of natural energy it makes cats go a little bit crazy after they eat it. If your cat is house bound, simply bring this plant inside and they will seek it out. It’s full of vitamins and minerals. It’s a natural aid for hairball removal. Repot this into a bigger pot using Tim’s Best Potting Mix. Grow it outside in the sun and bring it inside when your cat needs a natural hit. You will find it in the herb section. Spring is a great time to plant herbs and they grow well, in pots, so you don’t even have to own a garden. It’s time to plant Basil and we have all your favourite varieties. I love the purple leaf form and it adds so much colour to a fresh salad. Gardeners often have no success growing herbs in pots because they use pots that are too small, and they buy cheap Potting mix. Buy one big pot and grow your favourite herbs in that. The plants protect each other from the hot sun. The pot needs to be at least 45cms wide. Potting mix holds the water, so the more Potting mix it holds, the better the chance, your plants will survive. Don’t buy cheap Potting mix. Our latest trial shows that both brands sold in woollies are poor. “Green Gardener” is horrific. The plants just turn purple and don’t grow at all. Our Tim’s Best Potting Mix is expensive, but it’s the best. Your herbs and vegetables will thrive. Grow Parsley, Chives and Basil. Grow the herbs you use every week. Grow Mint, Oregano and Rosemary in big pots on there own. These have bigger root systems so they smother other plants. Herbs grow fast so they need lots of sun. They can’t be grown successfully inside. Not even on a window sill. They need to be watered daily. We have the best herb selection in Macarthur. Talk to Lisa. We sold out of African Daisies last week so Hayden has bought heaps more this week. Look for a new variety called “Blushing Beauty”. It’s in the photo above. This compact growing small shrub has these beautiful golden flowers with the mauve centre. They only grow 45cms high by 45cms wide. They flower non stop for 6 months. They thrive in these dry conditions. They add so much colour to your pots and gardens in sunny spots. Lavender plants are flowering around Macarthur. Almost every gardener has killed a Lavender plant. You must plant them in the ground or into a bigger pot straight away. If you leave them sitting in the sun on a concrete path they will be dead within 2 weeks. When you get your Lavender plant home sit it in a bucket full of water. Wait until all the bubbles stop before removing it. Take it out of the pot and plant it in a sunny spot in your garden. Water daily until the plant has time to establish it’s root system. This could take a month. Lavender loves hot sunny spots. So don’t grow it in the shade!!!!! Once established, it won’t need to be hand watered. If you grow Lavender in pots then it’s not drought proof. It will need to be watered almost every day. Prune Lavender plants back by 25% after the first flush of flowers. This keeps them bushy and it makes them get even more flowers! Use the pruning to make pot pourri. You still have time to plant Tomatoes. We do have small seedlings for Arthur’s Big Greek Tomatoes this week. Arthur from Kings Charcoal Chicken Shop in Queen St Campbelltown bought this variety with him when he came to Australia 30 years ago. The fruit are enormous, up to 1kg. They have more flesh and less seeds. 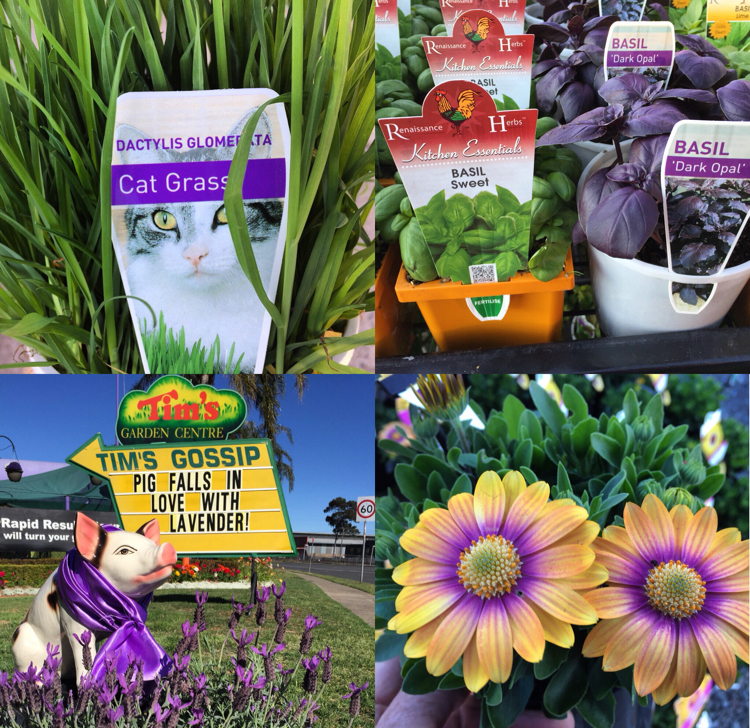 Plants cost $5.00 and all money raised goes to the drought effected local farmers this year. We only have around 150 plants. Pick the fruit green, and ripen inside to avoid fruit fly. We have so many people who come into our nursery just to see the flowers. We love this and we love seeing the flowers too. Our rose bushes are bursting into bloom. Come and smell the roses and choose a variety that has fabulous perfume. Look at the leaves, make sure it’s a disease resistant variety. We have beautiful plants. Come and talk to our Horticulturists. We love gardening, just like you!